Iniciou seus estudos de desenho e pintura no atelier livre da artista plástica Gladis Reveilleau, em Cabo Frio, em 1992, retornando em 1998 até o ano 2000. Hoje, aos 27 anos, formada em Pintura pela (UFRJ), Universidade Federal do Rio de Janeiro, a artista concentrou suas pesquisas na representação da figura humana, apresentando a essência do sentimento de angústia. Graduated in Fine Arts at UFRJ - Universidade Fededal do Rio de Janeiro, Brazil, the artist focused her researches in the representation of the human figure, presenting the essence of the anguish. 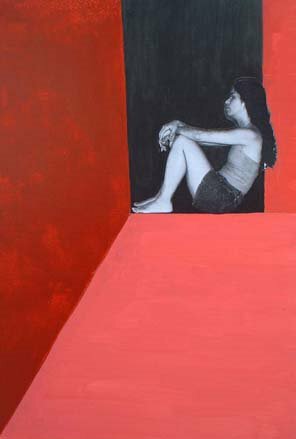 The human figure, with its thoughts and feelongs and the background, geometrical and spatial. The paintings has the focus in contemporean man, reduced inside squematically planned environments, what reveals us the actual images of anguish, associated to the boredom, the desparation and the fear of the citizens of big metropolises.